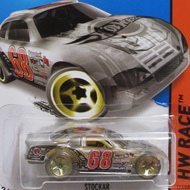 106/250 is part of the HW Off-Road series and the 2014 Treasure Hunt set. The white car sports a green stripe and a black stripe on the top. 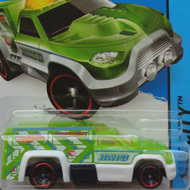 The sides have green, pink & black graphics as well as “120”, the Hot Wheels logo, “Ford Racing”, and the low production symbol. It has tinted windows, a black interior, pink 10-spoke wheels, and a black plastic Malaysia base. The Fiesta made its debut in the 2011 New Models series. It is based on the car used by professional rally driver Ken Block.